Super Vee was not quite a single-make series in 1982 but it was close. Ralt filled the top six finishing places seven times in 11 races and the only variety came from Bertils Racing Engines' new Anson SA3V, Gary Pratt's irrepressible Protofab-Riley and the old March 80V of Brad Hulings. 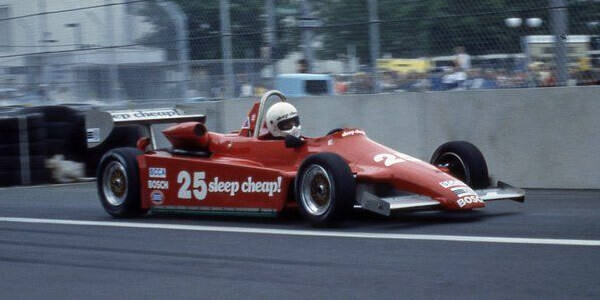 Argo produced their new JM12 but the best it achieved was a seventh place at Milwaukee driven by Jon Beekhuis. With Galles Racing having moved up to Can-Am and Arciero having found Pete Halsmer a CART drive, Michael Andretti took over the Arciero Ralt RT5/81 and dominated the FSV season. Ed Pimm, with a Red Roof Inns-backed RT5/81, Davy Jones in a similar Calidu-sponsored car, and Mike Miller were Andretti's closest competitors but only won one race each. Other winners were Jerrill Rice, again in a RT5/81, and Peter Moodie who provided the shock result of the season winning at Road America in the Anson. The results here have been compiled by Chris Townsend using US magazines such as SportsCar and On Track. Some results are still incomplete: qualifying positions are missing for the 1 Aug Milwaukee race, Michigan, Riverside and Laguna Seca. Entry lists are also sought.